Rebekah Letch, founder of Radha Beauty, grew up in Singapore in Southeast Asia in an Indian home. Radha Beauty opened their offices located in Northvale, New Jersey, USA, in 2014. Rebekah enjoyed the traditional oil baths a normal cultural occurrence where her mother would use many oil mixtures for nutrient-rich benefits to her skin and hair. The company believes that beauty can be sustained with the elements from Mother Nature. The products are all natural, organic, and cruelty-free to enhance the natural beauty of everyone. The Radha Beauty line uses only 100% pure organic cold pressed plants for the best quality oil essence. They are not an MLM (Multi-Level Marketing) company so that the prices of the products are affordable. Radha Beauty does not dilute or cut any of their essential or carrier oils. Their single oils are 4-ounce (120 mL) dark blue glass bottles to include a dropper for dispensing the oils. The oils have no fillers, additives, carriers, or bases. Use in your diffuser for fragrance and benefits for your body, mind, and spirit energy. The oils are for external use only to benefit dry skin, congested sinuses, and nasal passages, and to reduce cold and flu symptoms. 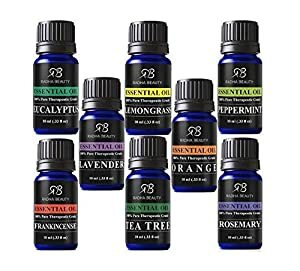 Their essential oil set is 10 mL (0.34 ounce) bottles to include Eucalyptus, Lemongrass, Peppermint, Lavender, Orange, Frankincense, Tea Tree, and Rosemary. This is perfect for you and a treasure for a loved one or family member. Use in your diffuser for aromatherapy, a massage with a carrier oil, make perfumes, soap, candles, and use for cleaning. Eucalyptus—is wonderful for the common cold and respiratory problems; an anti-inflammatory; helps rid nasal congestion; hydrates skin; and is a natural insect repellent. Lemongrass—is an oil for its relaxing qualities and feeling centered. Great for reducing muscle aches and pain; is a bacteria killer; an antiseptic; improves energy levels; and has vitamins C, A, and B, including folate and B9. It is also an insect repellent. Peppermint—sooths stomach and intestinal pains and inflammation, is impressive for calming and reducing anxiety, and great for uplifting the total you. Lavender—is for relaxation and calmness. Its light fragrance lifts your mood and spirits. Say goodbye to stress, anxiety, and pain with lavender. Orange—is calming with a wonderful soft fragrance, for relaxing and calming, is an antidepressant, stops spasms, is an aphrodisiac, diuretic, and stimulates the gallbladder to produce the flow of bile, and is a sweet sedative. The d-limonene (terpene) compounds provide for antioxidant and anti-inflammatory relief. Frankincense—is relaxing and helpful for insomnia and calms your spirit and moods, anxiety, and stress. Tea Tree—has potent germ-killing effects and will heal cuts. It feels cool to the body, you will feel reinvigorated, and it disinfects your home. Rosemary—stimulates hair growth, aids dry and oily skin. 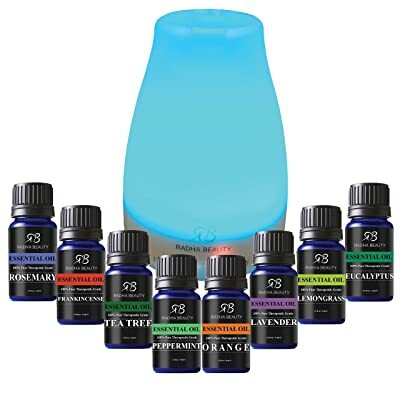 The Radha Beauty Set of 8 essential oils and cool-most ultrasonic diffuser holds 120 mL (4-ounces) of water to add 2 to 5 drops of essential oil (not included). It will cover 200-square feet and the mist will relax you with the revitalizing aroma. It has LED lights and shuts off automatically when out of water. Use in your home, office, Yoga studio, hair salon, and more places you want fragrance with therapeutic benefits as well. The set is a wonderful gift for family and friends. Use the oils separately or mix and blend with a carrier oil for a soothing massage. Gift-wrapping is available. Instructions are included with the oils and if you are not completely satisfied, contact the company for a full refund with no questions asked and you do not need to return the product. As a rapidly growing company, Radha Beauty is expanding across the USA and internationally. If you have an interest in becoming a wholesaler for your boutique or shop, check it out. I hope my endorsement for Radha Beauty has been helpful for you. Reveal the secrets of Mother Nature’s plant kingdom for a new healthy standard of living. The ancient cultures understood plants and their benefits as did the new pioneers with the Native Americans who truly understood and respected all plant life.